The tragedy of the Florida school shooting uncovered some poor journalistic decision-making and damage to the institution. Journalists jumped on a possible connection between the shooter and a white supremacist hate group based in Florida. But all may not be what it seems and journalists would be wise to avoid jumping to conclusions. The harm that can be done to society by misreporting this kind of accusation is simply too great. And the harm done to a journalist’s reputation and a news organization’s credibility and integrity is difficult to reverse (fake news, anyone?). The story broke with this posting by the Anti-Defamation League the morning after the shooting. The ADL, along with the Southern Poverty Law Center, are the most respected anti-hate organizations in the world. The ADL story involved social posts claiming the suspect identified with the Republic of Florida, a small, relatively new (4-5 years) militia-based, white supremacist hate group. The ADL interviewed the leader of that group who confirmed the link. News organizations jumped on the story and went all-in — big. Nearly every major national news outlet — AP, Newsweek, Time, Daily Beast, Huffington Post — and local news from L.A. to New York and of course Miami headlined the story. Most mentioned the “Republic of Texas” by name along with its leader Jacob Jered. Several went so far as to include the group’s mission statement and code of conduct. Unfortunately, all may be wrong — faked out by a publicity-seeking hate-monger looking to take advantage of an opportunity. If you are a white supremacist looking to grow your band of racists, you literally cannot buy this kind of publicity. The damage was done. The Republic of Texas, a small, non-descript and by all accounts petty little group of ne’er-do-wells got their several hours of fame and perhaps millions of dollars worth of promotional space. Jordan Jereb has a history of self-promotion; this time he got his wish. He even made it into the Daily Stormer, a major neo-nazi website. Journalists must use great care when learning information that points to hate group involvement. For starters, hate groups love this kind of publicity (not unlike terrorist organizations). They live for it. They work to get it. And when opportunities for promotion and membership pitches present themselves, they jump on them like a lion to raw meat. Seek the truth first — be skeptical and confirm. Knowing that hate groups are constantly looking for free publicity, confirm the facts yourself. Yes, the ADL seems to be a great, reliable source (and they still are) but make sure you are doing more than simply parroting someone else’s reporting and be skeptical of a hate group’s honesty and intentions. Educate yourself first with background, history and context. The KKK has a long and violent history of discrimination, racism and murder. Even the Republic of Texas has a history, short as it is. The Southern Poverty Law Center has a magnificent (if depressing) map of hate groups by region. Reporting on that history adds context and helps your audience understand how hate groups work and the threat they represent to society. Avoid giving hate groups a platform. Don’t publish the mission statement of racists except to prove their racism and certainly don’t publish their contact information (websites, phone numbers, addresses etc.). Hate groups need the news media — it’s why they send press releases for marches and events that never happen or are attended by far fewer people than claimed. 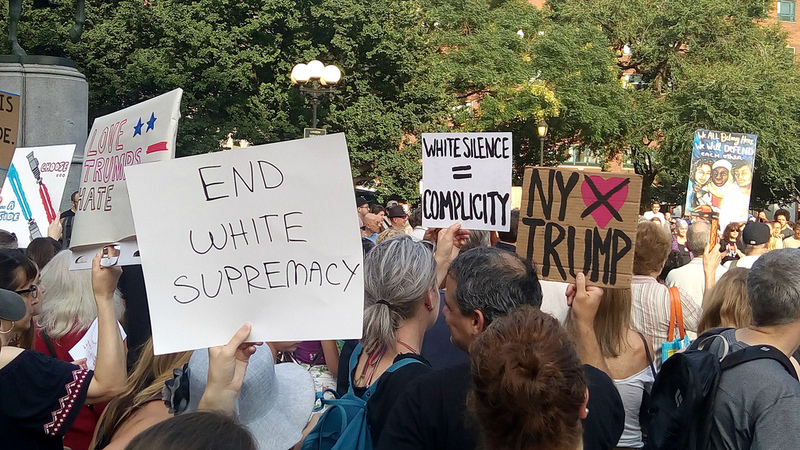 When covering a hate march, try to avoid coverage of the hate and focus on the counter-protest (which is generally much larger and more reflective of your audience). Challenge yourself to tell the story without giving a platform to racists and instead give your time to reasonable people who care about the community. None of this is to suggest journalists should avoid covering hate groups and racists in their communities — quite the opposite. A journalist’s obligation is to shed light on these fringe elements in the hope of revealing their intentions and their hatred for what they are — racism, misogyny, anti-Semitism and more. That coverage must consider minimizing the harm journalism can do when it inadvertently promotes horrific ignorance as common or mainstream. Your community, diverse as it is, deserves better. Remember, journalism at its best advocates for what is right and works to improve the world we live in. There are certain inalienable truths that journalism seeks to reinforce — hold the powerful accountable, give voice to the voiceless, protect the vulnerable. Racism is wrong and deserves a place in that conversation.